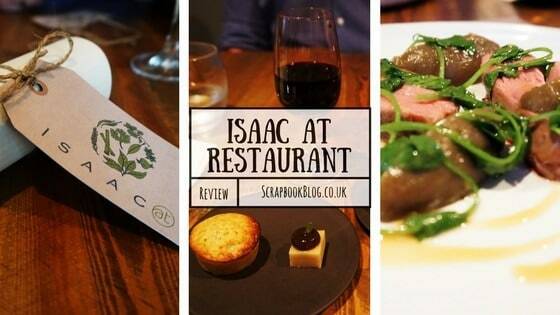 ‘Isaac At’ has been on our radar for a while, and on Thursday we spent one of the most enjoyable evenings in a long time, and I wish we’d visited sooner. Tucked away at the bottom of Gloucester Street it’s easily accessible from the station or on foot. Originally a pop up (hence the ‘at’ as they popped up in different locations) they’ve now found a permanent residence, opening last year. 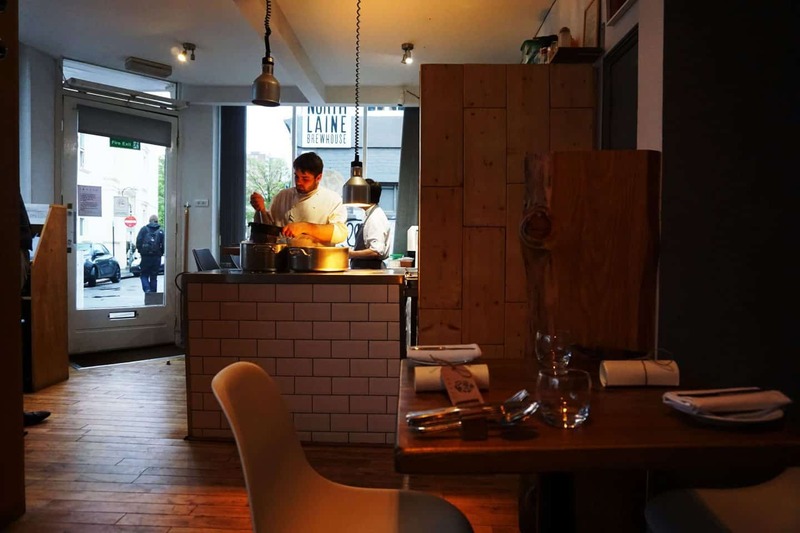 There are a few things that makes Isaac At stand out amongst the restaurants in Brighton, the main one being that the entire team are incredibly young. Isaac, the head chef hasn’t hit 25 yet, and the rest of the team are also in their early twenties. However their passion, creativity and skills could easily belong to people who have been working in kitchens for decades. The next, and in my mind unique quality that makes Isaac At stand out is that all their ingredients are locally sourced and wines are all English. 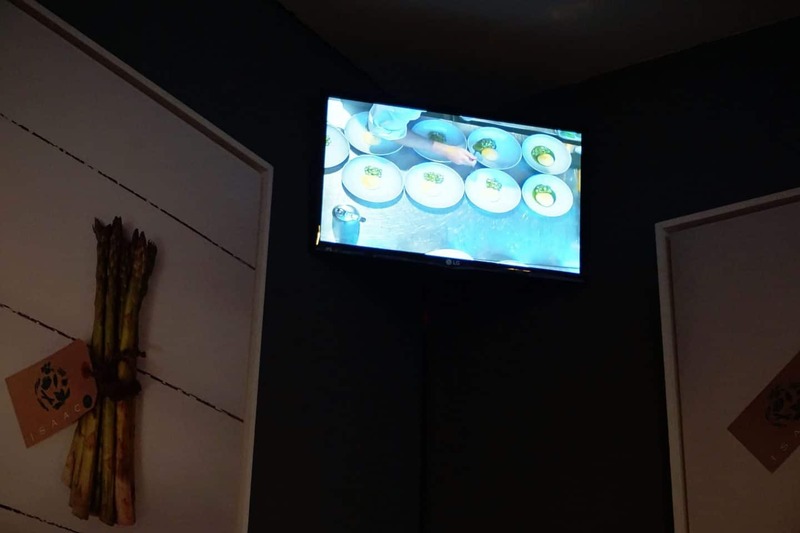 Everything was presented with such care and attention, as we could see from the two displays screens mounted in the corners of the restaurant. There are also two bar stools at the counter as you walk in which would enable you to see everything up close as it’s prepared. 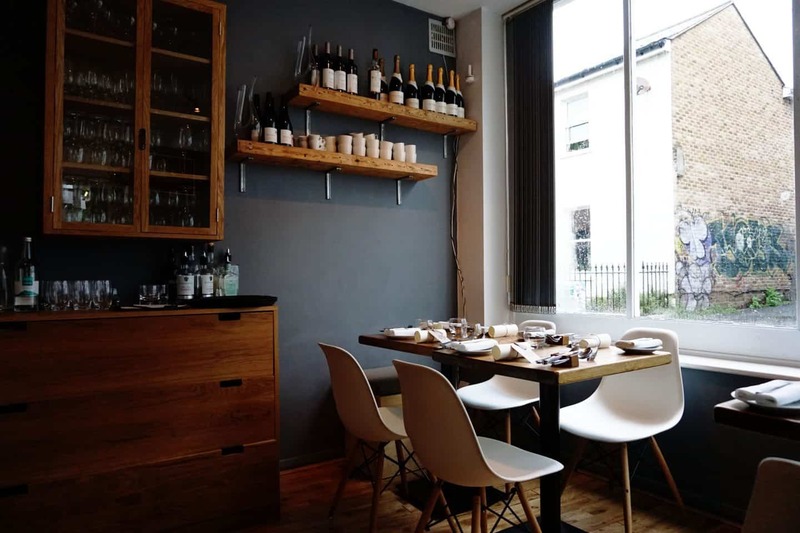 The ambience is pleasant; it’s a small restaurant of around 20 covers with wooden details including cutlery stands to keep you supplied throughout the seven courses. The menu is presented rolled and secured with twine, along with a list of locations for all the ingredients with distances from Brighton. Water glasses are kept topped up throughout the evening and is at no extra charge, for still or sparkling. 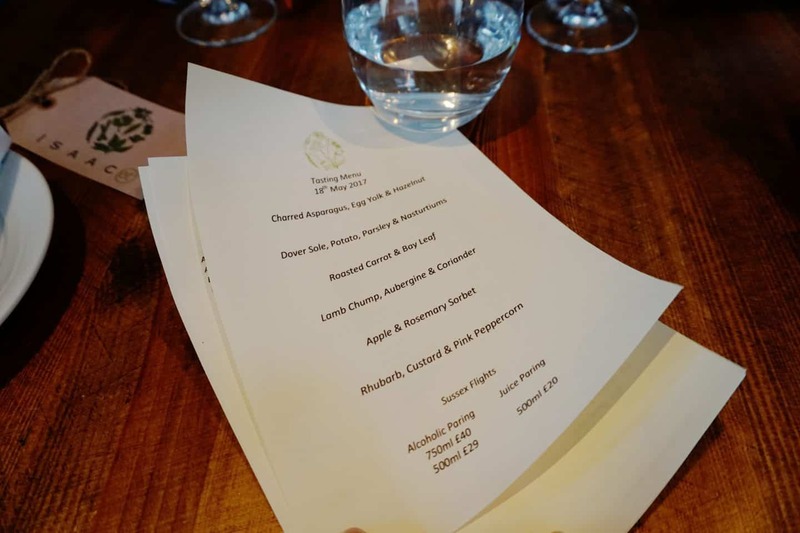 Each dish is presented on the menu with just the main elements; so you’re left wondering how things will be presented and in what format they’ll arrive in. The first course, the Asparagus course came in two parts, the pre-starter asparagus was served with charcoal mayo which oddly tasted like mayo and looked nothing like it. 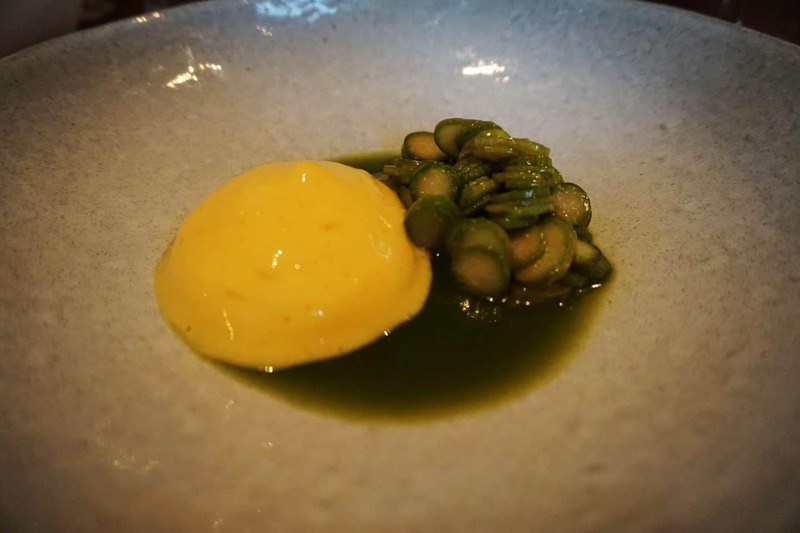 The starter itself was served with the fluffiest egg yolk and the asparagus had been roasted with hazelnuts – a surprisingly great combination. 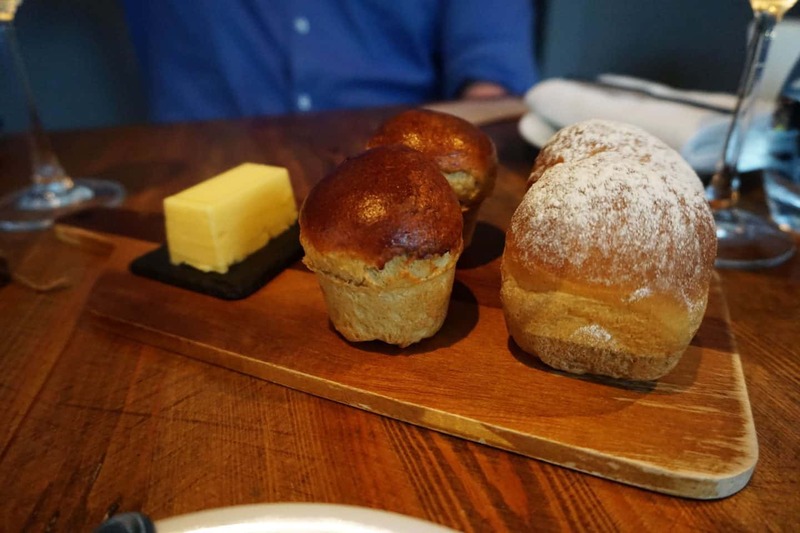 Between these two dishes we were served warm bread; two miniature loaves each – a treacle and stout and a shallot brioche, from memory. Fluffy and light and delicately flavoured. 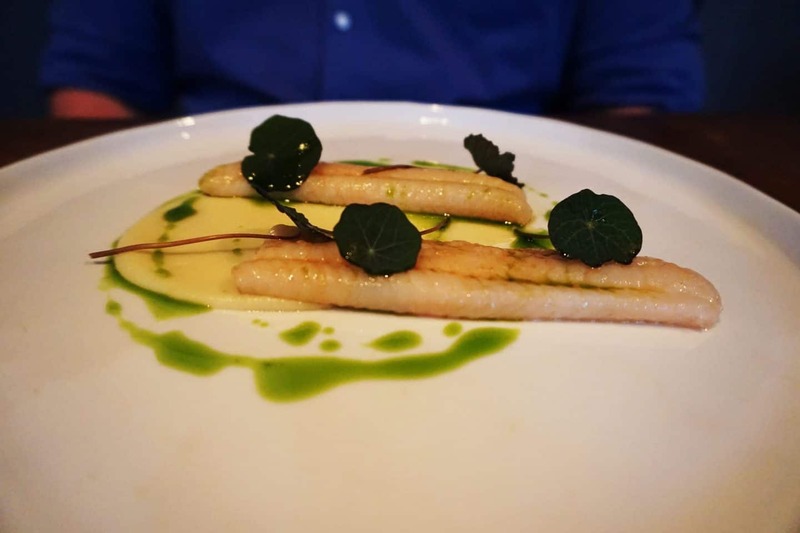 The next course was the fish course, Dover Sole served with potato puree, parsley oil & nasturtium leaves; something I’ve never even thought to eat let alone tasted. The process of the getting the potato to be so smooth is a long one (we asked what it involved- plus we could see the final stages on the screens during the evening too) and the dish was presented well. As I don’t eat fish I had seared chicken as a substitute. The vegetable course was probably my favourite of the savoury courses, soaked in brine overnight and then roasted for four hours. With the texture of roasted sweet potato but the amazing texture on the skin of four hours in the oven I could have eaten it again easily (but then carrots were the only vegetable I ate till I was in my late teens and still a favourite, so a carrot course was always going to be a winner, lets be honest!) The roasted carrot was surrounded by little ‘mini carrots’ though they were actually just lookalikes – topped with roasted pumpkin seeds. 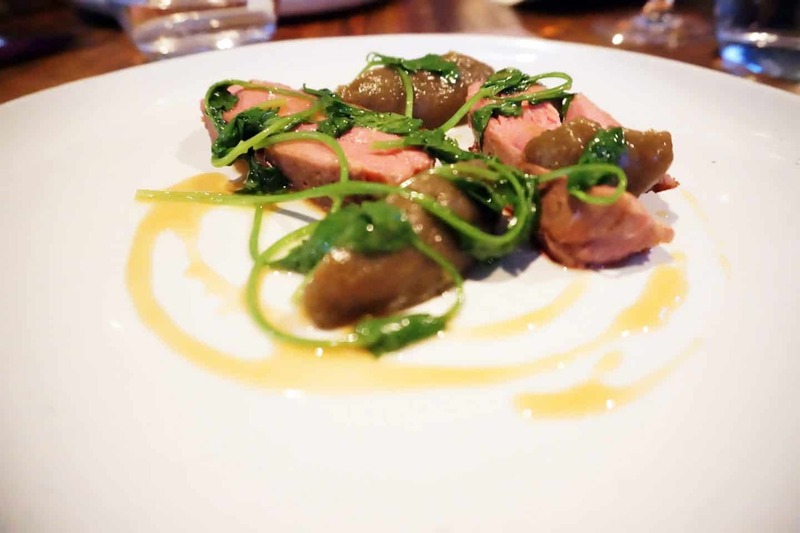 Succulent Lamb Chump was the next dish – from an East Sussex farm, served with aubergine puree and coriander. Simply cooked but full of flavour this was Sams favourite course of the evening. 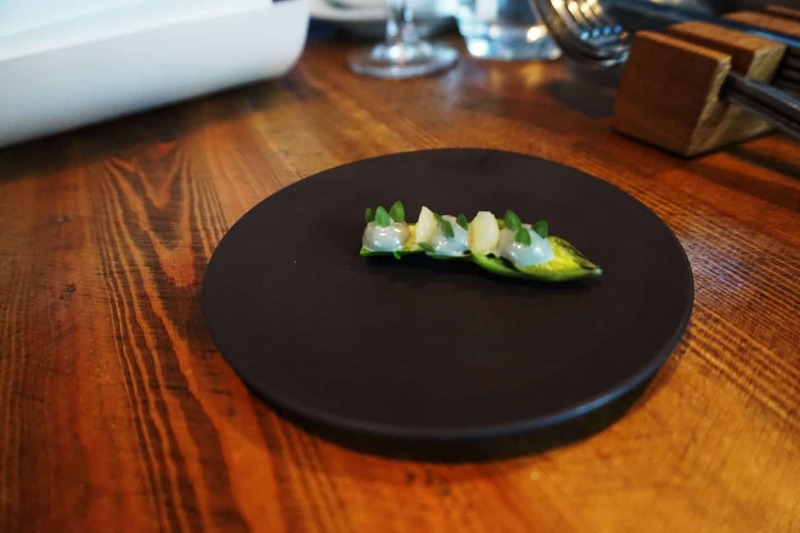 I will admit that the presentation became slightly formulaic for the savoury dishes; meat/fish served with a vegetable presented two ways, with a drizzle of something, though why change what works? 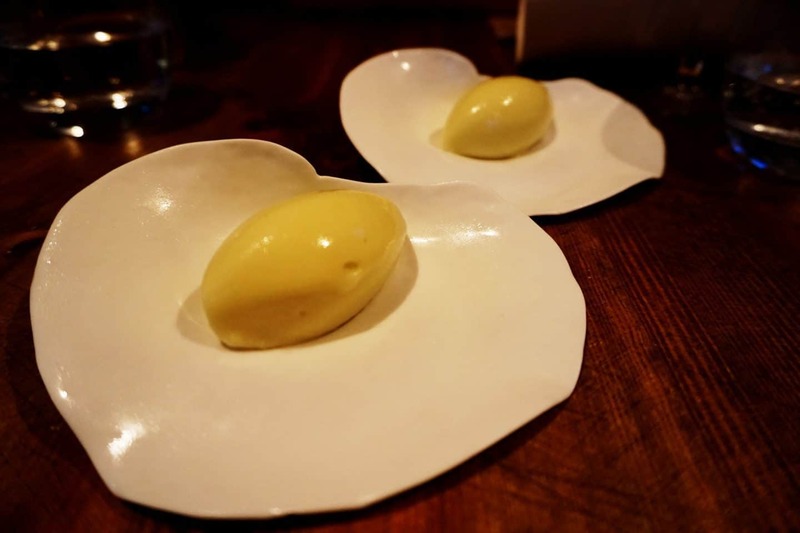 A palate cleanser of Apple & Rosemary sorbet (served on delightful shell shaped dishes) was served before Rhubarb Sorbet, Viennese creme diplomat custard (I think, I admit I was too busy gawping at the food to listen to the description by this point) with melt in the mouth miniature biscuits and pink peppercorn something or other – whatever it was it was amazing and I wish I had listened more intently! 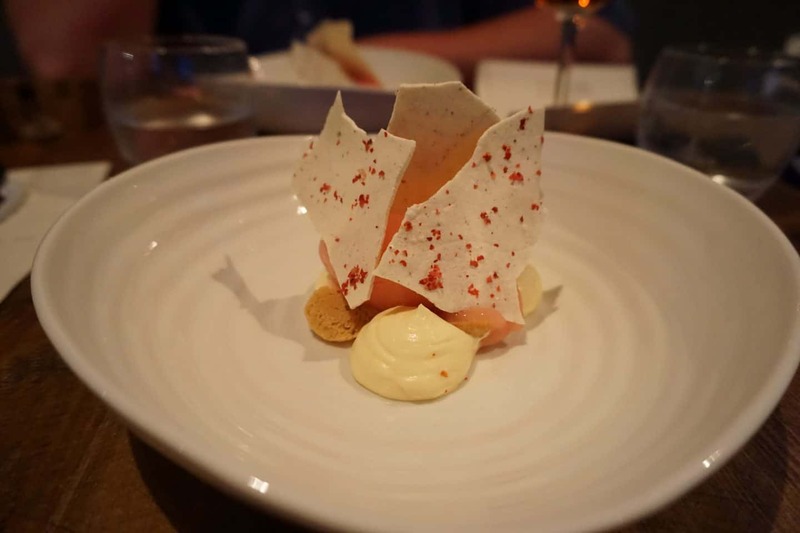 All the flavours combined so amazingly well together, as well as the texture of the crumbly biscuits and the smooth wafery texture, plus the rhubarb sorbet. It was just perfect. 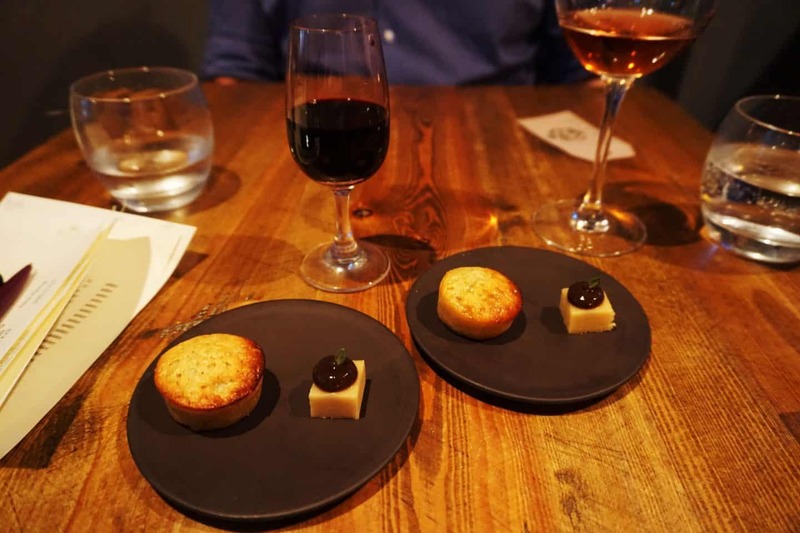 Lastly were two tiny but flavoursome sweet treats; a Spiced cider soaked cake and a square of Lemon & Thyme fudge with burnt apple -which was out of this world; and the port was the perfect accompaniment too. The service was perfect, Alex the restaurant manager and another waiter were kept busy with the tables (one of which was a party of around eleven) but made sure everything ran smoothly, drinks topped up, napkins refolded when a guest left the table, and were full of knowledge about the menu, the wines and the business. After chatting to both of them we found out they’d done some of their training at City College, so local produce and local talent. The way the chefs and the front of house team coordinated was like a well choreographed dance, I think we were served dishes by every member of the team, chefs included and as each dish was presented a short explanation was given and any questions answered fully and without hesitation. It really was something to behold and impressed us both immensely. From a hotel manage background I know exactly how hard it can be to get a good team and to find a kitchen team who treat the front of house team with respect is tricky, let alone one who gel as well as this team do! Alex has a knowledge of wine that defies his age, and delights in curating the wine menu from English vineyards. Although there is a wine or juice pairing available, Sam was driving and I had already had a drink at lunch and an early morning planned the next day so we didn’t indulge. Instead we started with a glass of Ridgeview Merret Bloomsbury Sparkling Brut, Sussex sourced. I then had a glass of Pinot Noir Diamond Fields, a 2013 vintage like the sparkling wine. Sam had a Beetroot, Apple & Rhubarb Juice along with a glass of Blackdown Elderberry Port with the sweet course, which was sweet and syrupy. 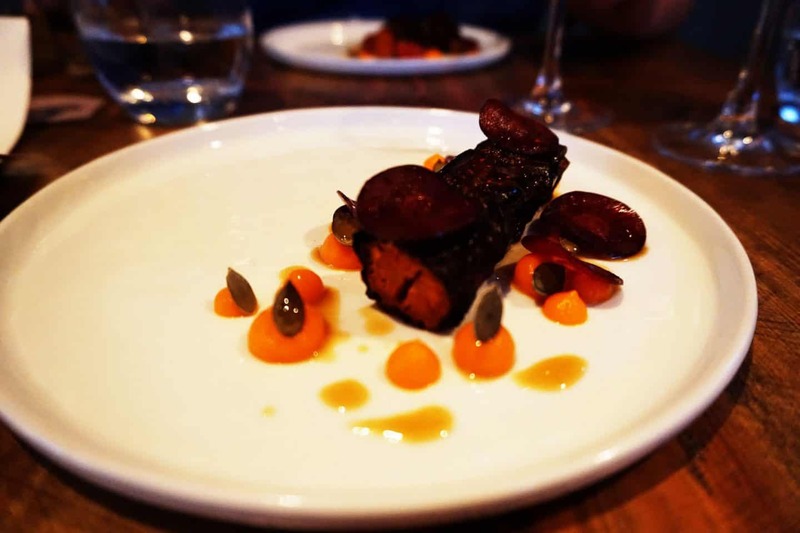 The menu changes every two months or so, with a dish a week being modified or changed depending on supply and seasonality. You can view a sample menu here and make a reservation (you’ll need one!) here. Open from Tuesday to Saturday they have recently added a Saturday lunch sitting due to popular demand. 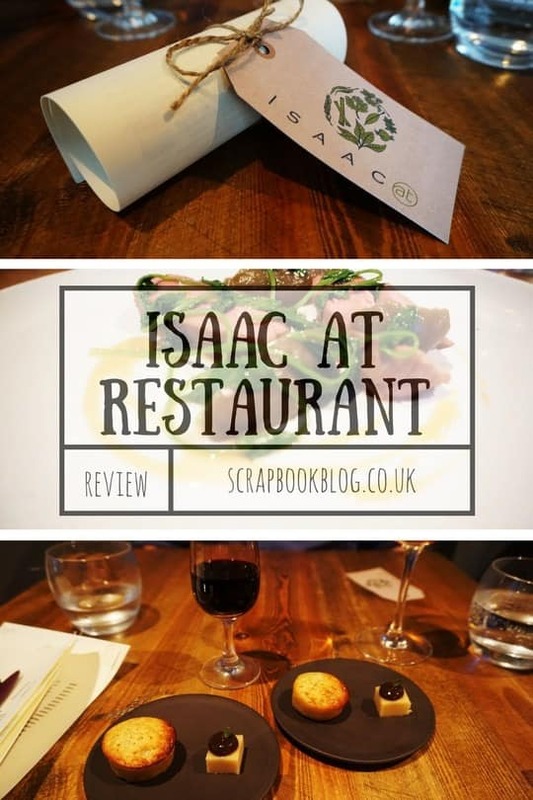 Our experience has put Isaac At in the my top three favourite restaurants in Brighton, and we’ll definitely be back and next time we won’t be driving so we can take full advantage of the wine pairing alongside our meals! 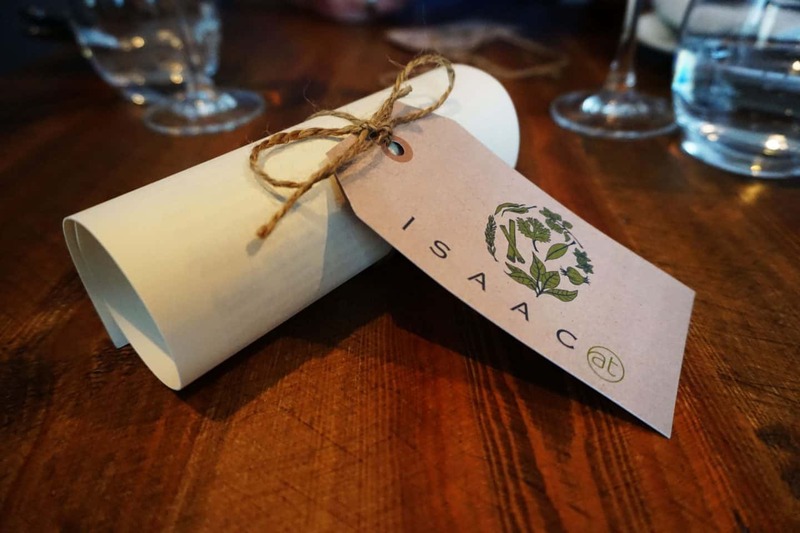 We were invited to dine at Isaac At for the purpose of this review. All words, opinions and images are my own.